You are here: Home / News / Time to Celebrate Dads. (ThyBlackMan.com) Father’s Day is a very hard day for me as I miss my father more than I have the words to convey. I try to channel that energy into celebrating fathers and what they mean to community and family. There are so many brothers that are amazing fathers to their children, and children in the community. 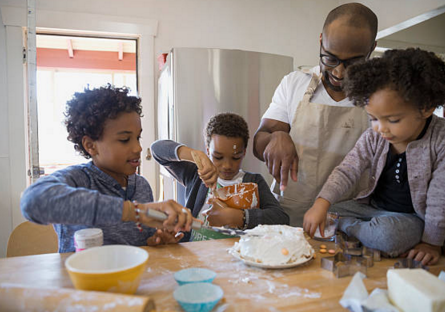 Some are married, others are co-parenting…and some are single dads. Yes, there are more single dads out there than we realize. Many of them are not on child support, nor can they bring themselves to file such. They are just doing what they have to in order to raise their children. June 16, 2018 is a time whereby we can come together to celebrate the men of our community and families. The truth is they are irreplaceable. Yes, we understand there are men out there that are absentee fathers, abusive, or have terrible relationships with their children. However, there is a secret we tend to forget every 2nd weekend in May…there are many mothers out there that are absent, abusive and have terrible relationships with their children. Its not a fighting point, it’s a fact and one we don’t pay attention to because men do not highlight it. Brothers are not out there on Mother’s Day exposing the horrible experiences they have with the mothers of their children…or their own mom. Instead it’s a time by which we come together to celebrate the mothers of our communities, and the women that embody that spirit. We uplift the very idea of what motherhood is and the importance of such. This is what makes Mother’s Day beautiful. In all fairness its time we celebrate Father’s Day with the same care and celebration. If we aren’t talking about dead beat moms (yes, they really do exist) in May…let’s not have that discussion next weekend. Fathers offer to our children what we as mothers cannot. They are our perfect balance and we need them. They teach the children a different kind of strength and compassion, and they are awesome problem solvers. They are protectors, and nurturers to our children in ways we could never be. We do things as mom to the best of our ability, but dads offer something different and its detrimental when it is not praised for the splendor it is. Its time to celebrate fatherhood and the importance of it in front of our children. Next Sunday don’t fight, rehash, and air dirty laundry. Uplift a father…know you wouldn’t be here without one just as you wouldn’t without a mom. Take the time to recognize the men that father their children and then some. The ones that show up at school and mentor as many children as they can. Take the time to celebrate all the great things fathers do every single day. If we look around, we see dads at work every day. They cook, do homework, coach, comb hair, potty train, kill the monster under the bed, read bed time stories, demand accountability, teach responsibility, help establish standards, and they get it done with their own laid-back dad way. On Father’s Day I will remember that I am the woman I am today…in part because my dad was the Man…and I watched him be that for so many others. It’s far time Father’s Day be honored on par with Mother’s Day. It’s time to truly celebrate dads.